The US is turning into a gaming nation, according to a new study from the Parks Associates market research and consulting company. In a three year span, the number of gamers in the country has nearly tripled. The rapid rise in numbers is thanks to social gaming and free-to-play business models; people who wouldn’t typically identify themselves as gamers, now game with gusto. Of that 135 million, Parks’ analyst Macchiarella says that 80 percent of the US’ gamers either social games—predominately refereed to in the study as Facebook games—or free-to-play games. Following those numbers, the favored game playing devices happens to be a computer or laptop across all age demographics. Traditional game consoles follow the computer’s popularity; nearly rivaling computers in the 25-34 and 18-24 age groups, but dropping in popularity as age climbs (not surprising). Interestingly, the study found that mobile gamers have increased as smartphone adoption has become more widespread. In 2008, only 7 percent of gamers downloaded mobile games, while 2011 yielded an increase to 18 percent. 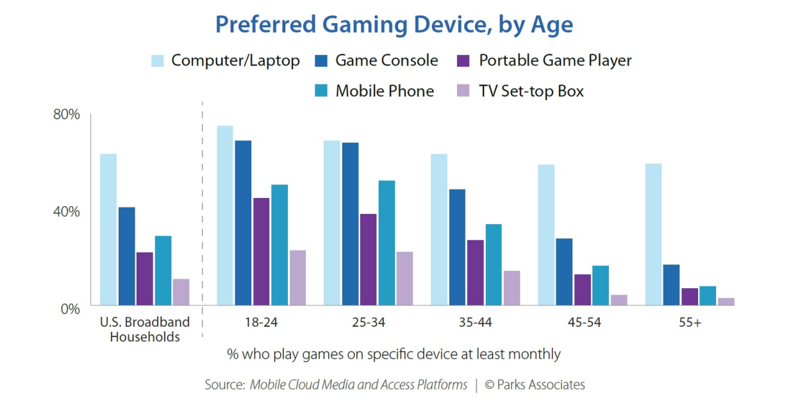 Mobile phones beat out portable game players as preferred gaming devices across all age groups. The burgeoning popularity of tablets will also increase the range of mobile games ; in the third quarter, 71 percent of adults and 79 percent of teens who owned tablets played a game at least one hour a month. The report banks on mobile gaming being key to US gaming expansion over the upcoming years, as the potential for monetization seems to be greater compared to free-to-play games. Free-to-play and social games are converting the nation because of the lack of intimidating barriers like retail cost and subscription fees. Those who avoid buying games at retail stores, and don’t typically consider themselves to be gamers, spend a good amount of money buying virtual items and upgrades (microtransactions). People who spend money on free-to-play tend to spend the same comparative amount as the cost for a traditional games; Facebook spenders on average spend $29 monthly, and free-to-play spenders average $21. Game publishers are finding the traditional retail model—where the money earned is limited to the game price—is not as lucrative as free-to-play games are appearing. Free-to-play money can potentially flow forever as long as the user base stay’s engaged. So, instead of cutting support when customers buy a game, companies are focused on building gaming communities. Developers also find social gaming appealing thanks to the low up-front development costs. However, convincing players to spend their money is an ongoing challenge; most titles only make money off of 10 percent of the user base. The Parks analysis believes that mobile gaming has more potential to make money and expand than free-to-play and social games. A low price point in the app stores are appealing, but the main money draw is the in-app purchase. In-app purchases are more impulsive than microtransactions because payment systems, like through an iTunes account or carries, make it easier to click-and-buy. In three years, 44 percent of the country is now gaming thanks to a rise in social networking and mobile adoption. If the trend continues with the same momentum, we could see a majority of the country planting virtual crops and setting up virtual kingdoms.